PERFORATED MUSIC FOR MECHANICAL ORGANS, Fairground Organ Music, Street Organ Music Books, Dean Organs, Barrel Organs. The Bristol Showmen's Store was founded in 1909 by Arthur Oram, they were formerly the UK's sole agent for the famous Parisian organ building firm C.H Marenghi & Cie. Today this name survives as Dean Organ Builder's trademark music label. Under this trade label we sell both historic and modern musical arrangements for all manner of mechanical musical instruments: Organs, Orchestrions & Pianos. 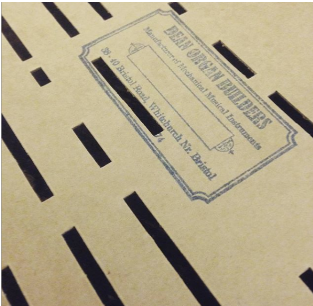 We cut and supply new perforated cardboard book music for mechanical organs, including sourcing old or second hand music. Our many years in the mechanical organ business has given us a unique knowledge of organs and their musical capabilities ensuring that we provide the best possible music available to suit your organ whether cut on our own machine or sourced from one of our many contacts worldwide. Standard Keyless 3.48mm - 3.50mm centres. Ruth & Alfred Bruder Keyless - 3.85mm centres. Standard Keyed 3.48mm - 3.50mm centres. Gasparini, Perlee & Pell Book Spacings. Paper Roll hand turned - 3.86mm centres. The above spacings for book and roll music are generally the sizes that we supply new music for. However, should you have an instrument working on a different system we are always happy to look at producing new music, or procurement of pre owned music from one of our many associates worldwide. Please contact us to discuss your specific needs. For more than forty five years Dean Organ Builders have been England's leading manufacturer of blank folding cardboard books. All of our own manufactured cardboard music is made in our workshops based here in Whitchurch, Nr. Bristol, England. We use traditional time tested methods meaning quality and longevity is ensured. The high quality English board which we use in our manufacturing of organ books has been used for mechanical music for more than sixty five years, meaning that books purchased by you today if looked after will last generations. As members of the Mechanical Copyright Protection Society (MCPS), Performing Rights Society (PRS) and Phonographic Performance Ltd (PPL) all of our musical arrangements for mechanical organs are registerd and / or licensed via the appropriate organisation and any copyright royalties are paid if applicable. This means you can rest assured you are buying legitimate music. All of our work is also protected by these copyright societies. 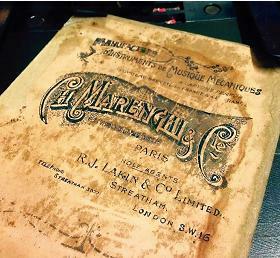 No historic instrument is complete without a repertoire of suitable period music. 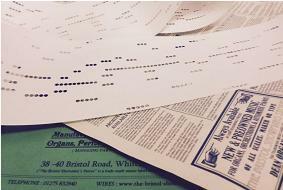 Over many years we have absorbed in to our own archive other companies music patterns as well as our own hence we have been able to amass one of the countries largest libraries of historic patterns for the most common fair organ scales used in England. This includes large quantities of music as supplied by the great Parisian factory markers from firms such as Gavioli, Limonaire, Marenghi, Gaudin and Gasparini. As well as from other notable firms such as J. Verbeeck Islington, Carl Frei, Van Steenput, Aug Schollaert and many more. Our library also includes music suitable for the repertoire of German organs with music from the likes of Gustav Bruder and Carl Frei. We have our own in house arrangers and when our extensive pattern library doesn't contain the piece of music you require or you want to commision a new arrangement, we are always happy to consult on producing new music customised to best suit your instrument. We also sell blank card for the production of perforated music. Alternatively contact us directly for a free music price list by E mail for a PDF or by post including an S.A.E.